PopCap Games has announced that the first 500 boxed retail copies of Bejeweled Twist will be donated to Games For Soldiers, a non-profit organization that distributes videogames to U.S. troops stationed in Iraq and Afghanistan. "We really appreciate PopCap's generous contribution - one of several the company has made to our organization - and are ramping up to distribute copies of Bejeweled Twist to soldiers in the field by mid-December, just in time for the holidays," said Games For Soldiers founder Jesse Williams, a Specialist with the 1-158 Infantry Battalion who launched the organization after returning home from a one-year deployment in Khost, Afghanistan. "So-called 'casual' games like Bejeweled, Peggle and Zuma are hugely popular with military personnel of all ages, ranks and backgrounds," he continued. "These games lend themselves to the occasional and haphazard 'down time' common to military life in combat areas, and provide some distraction and even stress relief in what are often high-adrenaline and/or high-anxiety environments." Williams laid the groundwork for Games For Soldiers during his time in Afghanistan, when he began contacting game publishers seeking donations for his unit's Morale, Welfare and Recreation center. His group, the only one in existence that focuses solely on providing troops with videogames, accepts contributions from both individuals and companies; PopCap, along with Microsoft and 2K Games, were recently cited by Williams for donating "an utterly massive number of games" to the cause. 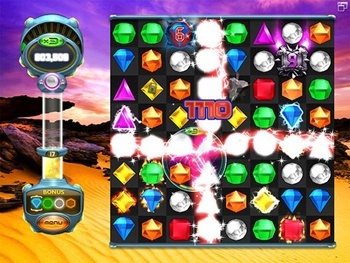 Bejeweled Twist is currently available for download at the PopCap Games website, and will hit retail shelves on November 18.